Less than one week after the August 2018 death of iconic singer Aretha Franklin, news broke that she died without having executed a last will and testament. Immediately, discussion centered around the possibility of family members and others preparing to battle over her multi-million-dollar estate. The same thing happened with singer-songwriter-producer Prince, who died in 2016 without a properly executed will. The battle over his estate wealth continues to this day. So what’s the deal with people in the entertainment industry? Don’t they understand the value of having their estate in order? But it happens more than one might guess. Although there are other ways to properly and legally pass wealth onto the next generation upon an investor’s death, a great many wealthy people alive today are living without the benefit of a last will and testament. 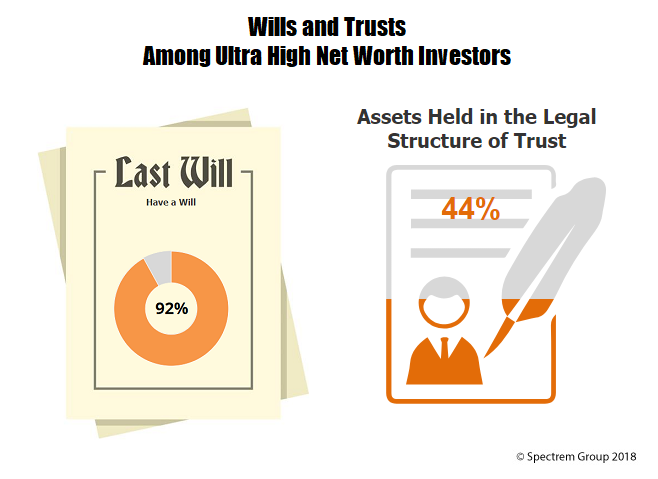 According to Spectrem’s most recent study of Ultra High Net Worth investors with a net worth between $5 million and $25 million, 92 percent have a last will and testament. That means 8 percent do not. From the study on investors with a net worth of at least $25 million – The Wealthiest Americans – it was learned that 83 percent of investors have a wealth transfer plan in place, which means 17 percent do not. The Wealthiest Americans reports that 88 percent of investors with a net worth of at least $25 million have assets in a trust, but that likely does not include all assets. And a trust is not the same thing as a will and does not perform the same tasks upon the investor’s death. A will is a statement from an investor on how he or she wants their property distributed to others upon their death. A properly written will can include details on all assets, and can prevent any post-death arguments among family members regarding the proper distribution of those assets. A trust is set up to manage property during an investor’s life, and can allow the trustee to distribute assets upon the investor’s death as well. But, again, a trustee can only distribute the assets in the trust, and most investors do not include all of their assets in a living trust. A majority of wealthy investors have multiple trusts, which can cause conflict among inheritors when it comes time to distribute assets unless a will is written detailing the way the assets of the different trusts are to be distributed. Trusts are also expensive to execute, much more so than the paperwork required to have a will created and executed. So why do your investors avoid creating a will? The Aretha Franklin and Prince cases can be used as examples for why wealthy investors should have a will prepared. The Prince case is two years old as of mid-2018, and does not appear close to any long-term resolution as people continue to speak up about being eligible for some of the estate. The Aretha Franklin case is predicted to be a long-contested matter which will overshadow the pain that fans felt upon her passing. The same can be true for investors. Although they will be gone and not in a position to care, the legacy of a wealthy investor can be tarnished by a prolonged argument among inheritors over how an estate is handled when the time comes. A great number of lawyers make a huge amount of money contesting the distribution of estates. A Google search for stories about contentious probate situations cranks out millions of recaps of probate events that last years, and in many cases, families are torn apart as a result of probate arguments. A last will and testament does not always prevent such events, but it goes a long way toward indicating how an investor wanted his or her estate distributed.